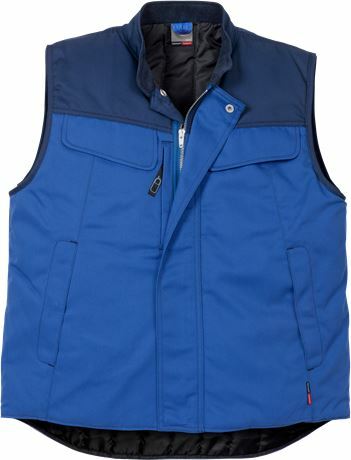 Waistcoat for industrial work in durable material with high colour fastness. The colours are aligned with all industry garments, making them easy to mix and match. 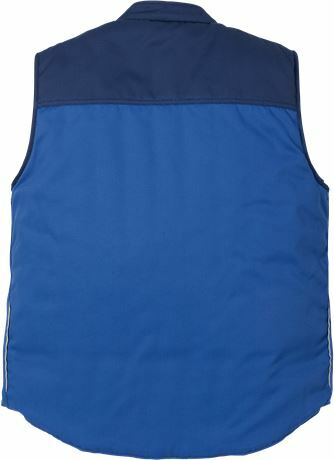 Material: 65% polyester, 35% cotton. Wadding 100% polyester. Lining 100% polyester. Two-colour / 3-needle fell seams / Contrast stitching / Zip front / Quilted lining / Reflective detailing in side seams / 2 chest pockets with internal pocket and flap / Diagonal cut front with side pockets integrated into seams / Mobile phone pocket with zip and storm flap / Inside pocket / OEKO-TEX® certified.